At least 20 people were killed on Thursday in a car bomb and gun battle at the Yemeni defense ministry compound in the capital Sanaa, sources inside the complex said, in one of the most serious attacks in the past 18 months. The defense ministry said the attack targeted the ministry's hospital and most of the gunmen had been killed or wounded. "The attackers have exploited some construction work there to carry out this criminal act ... the situation is under control," the ministry said in a statement on its website. Witnesses said the explosion shook the compound in the old district of Sanaa, where the country's central bank is also located. "The attack took place shortly after working hours started at the ministry, when a suicide bomber drove a car into the gate," the defense ministry source said. "The explosion was very violent, the whole place shook because of it and plumes of smoke rose from the building," an employee who works in a nearby building told Reuters. Yemen's defense minister, Major General Muhammad Nasir Ahmad, escaped a car bomb on his motorcade in September 2012 that killed at least 12 other people. At least 20 soldiers were killed and dozens of others injured when suicide car bombings rocked the Yemeni defense ministry in the capital Sanna on Thursday morning, officials told Xinhua. 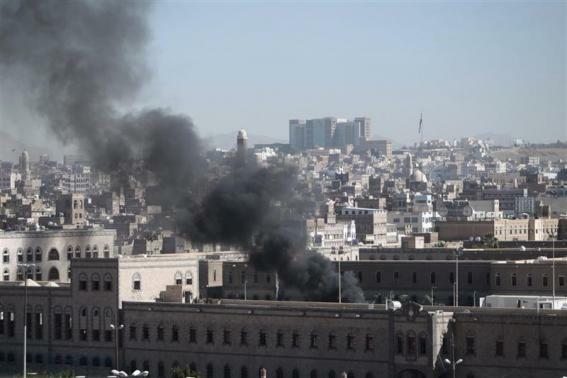 An official of the defense ministry said anonymously that the explosions were caused by suicide car bombings that damaged part of the wall of the ministry in downtown Yemen, adding that first car bomb hit the western gate of the ministry and the second one broke into the gate and exploded inside the ministry complex. At least 20 soldiers were killed in the blast following exchange of gunfire with attackers, he said. Medics in Al-Jomohoury Hospital said the hospital has already received 32 wounded soldiers. The defense ministry is located in a densely populated area and the attack occurred as local citizens were heading to work. Witnesses told Xinhua that ambulances were seen rushing to the defense ministry and heavy gunshots were heard inside and near the ministry building following the blast that smashed the windows of neighboring residential houses. Unidentified gunmen on Sunday shot dead a senior military officer in Yemen's southeastern province of Hadramout and wounded two of his bodyguards, a provincial police officer told Xinhua. "Unknown gunmen fired at Army Commander of the 37th Armored Division, Ahmed al-Marfdy, killing him instantly at the scene in al-Qatn town in Hadramout province," the police officer said on condition of anonymity. The bullets also hit two of the military commander's bodyguards who were later transferred to a local hospital after sustaining severe wounds, the police source said. The gunmen on motorbikes fled the scene after the attack, and the security services have launched investigation. The attack is the latest in a string of bombings and killings targeting senior military and security officers and some foreigners in Yemen in the past few months. No group has so far claimed responsibility for the attack yet, but militants of the Yemen-based al-Qaida offshoot are usually blamed for such assassination attacks, mostly in the country's southern regions. The al-Qaida in the Arabian Peninsula, which emerged in January 2009, is considered as the most strategic threat to the Yemeni government and its neighboring oil-rich Saudi Arabia. Thousands of pro-secession protesters took to the streets of Aden, southern Yemen on Saturday to mark the 46th anniversary of independence from British occupation and demand autonomy from the north. The separatist demonstrators across the southern areas gathered in Aden's central Parade Square, waving flags of the former South Yemen and carrying banners with pro-independence slogans. Omar Ahmed, a leader of the separatist Southern Movement, told Xinhua that "the southern people confirm their rejection of the national dialogue that is taking place in the capital Sanaa." On Wednesday, Yemen's southern separatist movement withdrew from the ongoing national dialogue after failing to reach a political solution. Yemeni factions started the comprehensive reconciliation dialogue in March as part of a power transition launched after the 2011 mass protests. The southern representatives boycotted the dialogue in August, demanding President Hadi to allow discussions on their right of self-determination. They then returned to the talks in September mediated by the United Nations envoy Jamal bin Omar. The southerners complained of being economically and politically marginalized and discriminated against since the northern troops won a four-month civil war.